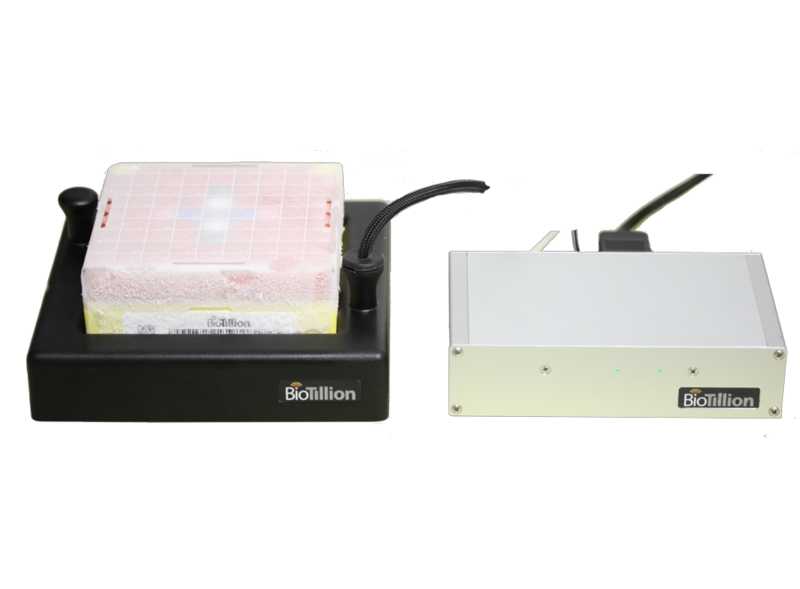 The BioTillion BoxMapper IIc provides a reliable method for mapping the contents of a freezer box without removing it from the cold environment. BoxMapper IIc can map the contents of a standard freezer box within seconds without removing it from the cold. For example, a sample box can be mapped while a box is in a CryoCart, dry ice or similar environment. The resulting map can then be seamlessly imported into any of an expanding group of LIMS software packages. Tight LIMS-BoxMapper integration allows the user to easily locate any given sample quickly and accurately. Any inconsistencies between the box contents and the LIMS database can be easily flagged. Because frost is not an issue, no de-icing is necessary. Quick mapping of the box contents helps preserve sample integrity because thawing is kept to a minimum. Each box label has an RFID tag, 1D, 2D barcodes and human readable text with exactly the same information in each. A box is mapped simply by placing it on the reader. The box orientation is detected automatically. Once the vials are mapped they are associated with that particular box via the LIMS system. A stand-alone, LIMS independent application is also available. This program can be useful in certain offline situations or in situations where a LIMS package is not used. It can export the RFID data in formats for use by text editors and spreadsheet applications. The BoxMapper is available for both 81 and 100 positions, standard 135 mm (5.25") sample boxes.